Does this seem familiar? How many languages in your school? Controlling a primary school class can be testing for teachers at the best of times. 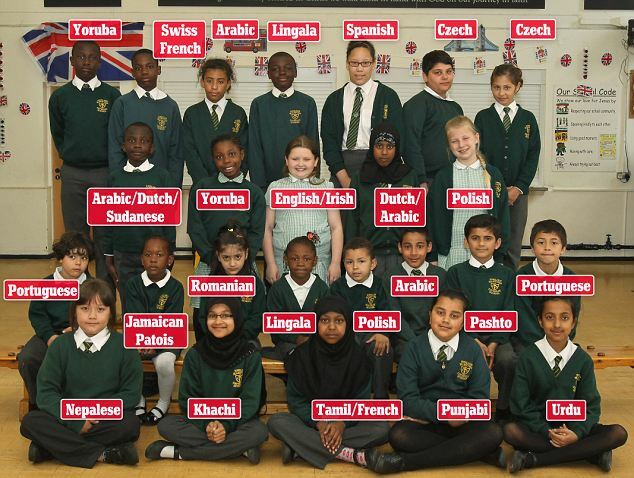 So spare a thought for those at the English Martyrs’ Catholic School in Birmingham where the 414 pupils speak an incredible 31 languages between them. As this picture shows, children at the school who speak English as their first language are in a tiny minority. This is an all too familiar pattern in areas of the UK, yet Teachers are expected to teach them as if they were natives and have been through the education system but without any support or guidance on what to do when they find that they cannot speak to these children themselves. Sadly the feeling of loss of confidence and decreased self esteem are not uncommon. Despite the challenges facing teachers, the diversity appears to have improved results at the school in Sparkhill. New head Evelyn Harper attributes top SATs scores to the value many of the pupils’ home cultures place on learning. What is your success story? How many languages do the pupils speak in your school? but more interestingly How many languages do your staff speak in your school? Is there a huge mismatch? How are we going to resolve this mismatch?